Do you Suffer from Painful ‘Ear Popping’ when Flying? Every year thousands of people head abroad for business trips and holidays, but instead of looking forward to their trip, many dread the inevitable ‘popping’ pain they will endure during take-off and landing. When your ears ‘pop’ it is your body’s way of coping with a change in pressure, during air travel the pressure is caused by changes in altitude. If the pressure between the outside of the ear and the inner ear is unequal it can damage the delicate mechanisms of the eardrum, so the ear pops to equalise and remove the pressure. For some people, this popping is simply a brief and mild discomfort; however for others the pain can be agonising, and can even cause dizziness and temporary hearing loss. This is whereEarPlanes come in. 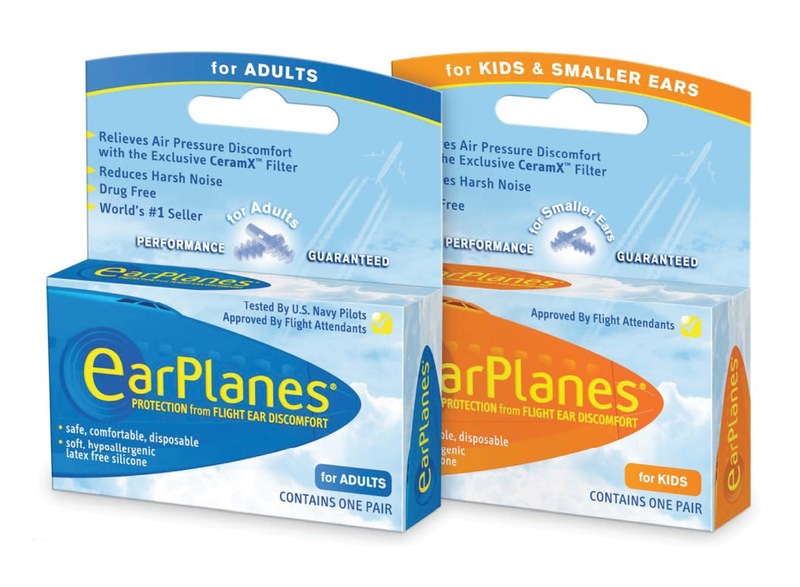 EarPlanes is the world’s first pressure regulating earplug; they contain a ceramic filter which slows the pressure change within the ear – to alleviate the discomfort. They are made of soft silicone, are hypoallergenic and latex free, and according to the packaging they were tested by U.S. Navy Pilots! They also claim that, if used properly, the plugs can reduce noise to 20 decibels – very useful when travelling with noisy passengers. On first inspection, Earplanes do not look like traditional earplugs; they have four ridges which need to be twisted into the ear like a corkscrew. The soft silicone texture made them extremely comfortable to wear, and they were good at reducing annoying background noise. Another big benefit is how cost effective they are; retailing at around £4.99 one set of plugs can be used for two flights (as long as you look after them properly), so they should last your entire holiday. The golden question, did they reduce ear popping? Yes they did, they reduced the painful build-up of pressure really well; just remember not to remove the plugs until the doors have opened and the pressure in the cabin has equalised. If your kids suffer during flying, they also make EarPlanes for children! EarPlanes are available at many airports (in WHSmith), plus leading chemists and supermarkets. Visit Cirrushealthcare.co.uk for more information.